Lawrence Anthony Smith, Jr., 82, of Champaign, passed away at his home on Sunday morning, March 31, 2019. He was the cherished husband of Pastor Donna (Hacker) Smith for 31 years. He is survived by her, as well as his children: Lawrence III (Jackie) of Spokane, Washington; Amy Smith of Pardeeville, Wisconsin; Ann (William) Petersen of Crossville, Tennessee; Andrew (Lisa) Smith of Winnebago, Illinois, Sean (Laurel) Smith of Priest Lake, Idaho; Alicia (Kent) Downs of Edwardsville, Illinois and Margaret (Chris) Bausman of Winnebago, Illinois. He is fondly remembered by nieces Cindy (Ted) Neumann and Jenny Hacker. He is also survived by 21 grandchildren and 10 great-grandchildren, as well as nieces and nephews and many dear friends and colleagues. He was preceded in death by his parents and his brother, Richard K. Smith, Sr., of Savanna. Lawrence was born in Rockford, Illinois, on September 25, 1936, the son of Lawrence Smith, Sr. and Alyce (Johnston) Smith. He was raised in Savanna, Illinois, and graduated from Savanna High School in 1954. 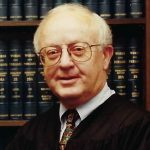 He went on to earn a degree in Commerce from the University of Illinois in 1958 and his Juris Doctor degree from the University of Illinois Law School in 1961. At the U of I, he played violin in the Symphony Orchestra and clarinet during a stint with the Marching Illini, endeavors in which he took great pride. After graduation, he entered into practice at the Smith Law Firm with his father and brother in Savanna until he was appointed an Associate Judge in Stephenson County in 1976. He was later elected a Circuit Judge in the 15th Judicial Circuit where he served until his retirement in 1996. In 2002 he and Donna moved to Champaign, Illinois where she served at Good Shepherd Lutheran Church and he delighted in Illini sports and cultural life. Professionally, Lawrence was a member of the Illinois State Bar Association and the American Bar Association, serving on many committees and bringing his unique experience and perspective to gatherings. He served on the American Bar’s International Legal Exchange and participated in study trips to South America and the (then) Soviet Union. He served on the Interdisciplinary Cooperation Committee of the Illinois State Bar Assn., and the Judicial Ethics Committee of the ABA. Among his accomplishments was a Certificate in Judicial Studies from the National Judicial College and the completion of a study of the Judiciary at Oxford University, England. In his devotion to his calling and his participation in study opportunities and professional meetings, Lawrence aspired to serve with integrity, humanity and fairness as a lawyer and a judge. Larry was similarly devoted to his Christian faith, and was raised in the Presbyterian Church, later becoming a Lutheran. He served in any number of capacities as a lay leader in the church, including service on the Board of Directors of Lutheran Social Services of Illinois and the President’s Cabinet of the Lutheran Seminary at Gettysburg. He was more than a “sidekick” in his wife’s church activities and involvements and was warmly welcomed and appreciated by her colleagues and fellow church members. He was most recently a member of Prince of Peace Lutheran Church, St. Joseph, where Donna recently has served as Interim Pastor. Above all else, Lawrence was devoted to his wife and family, and took tremendous pride in the accomplishments of his grandchildren and great-grandchildren. He treasured time with family and friends. In retirement, Larry’s passions were travel, reading and music. Those who knew him – whether as acquaintances or intimately, enjoyed his kindness, wisdom and humor. In lieu of flowers, Lawrence suggested that memorials be directed to the North American Lutheran Seminary, 311 11th St., Ambridge, PA 15003 or Prince of Peace Lutheran Church, St. Joseph, IL. Visitation will be 4 to 7 p.m. Friday, April 5 at Morgan Memorial Home, 1304 Regency Dr. West, Savoy, and from 9:30 to 10:30 a.m. at Prince of Peace Lutheran Church, 802 East Douglas Street, St. Joseph, Illinois. Services will follow at 10:30 a.m. the Rev. James Lehmann presiding. Burial will be 2 p.m. Saturday at Roselawn Cemetery, Champaign. So deeply sorry for your loss, Donna and children. Judge Smith was the greatest boss and friend. He hired me as his court reporter in 1988, and I worked beside him until he retired. He often spoke of his family and, having experienced his own life-changing difficulties, was there for me during mine. I will forever appreciate him for his kind words of encouragement and perseverance. I am out of state until after the funeral or I would certainly be there. I will be thinking of each of you and wishing you peace and comfort during these difficult days. The marvelous aspect of believing in Jesus as Lord and Savior is that He has already conquered the three dreaded enemies: sin, death, and the devil. May God continue to console Larry's family. Jesus said, "I am the resurrection and the life. The one who believes in me will live, even though they die;..."(John 11:25) May God uphold you with the same faith in His promises as you walk through this time of loss.